Duly assessed privilege issued in writing (16th century, medieval latin, officialese). Merged with "visament" (Middle High German: needless ornament) to "visepatenten" in mockery of awkward bureaucracy. Coercing Applicants With DPMAdirektWeb For TM Applications – A Failed Approach? 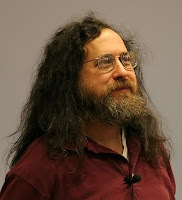 Following reports on the Australian itNews channel and The Register, a session of EPO patent officer Ralf Abbing relating to the 'big' issues in IP in relation to computing technology on this year's World Computer Congress (WCC) in Brisbane was interrupted by GNU founder and famous anti-patent activist Richard Stallman, advocating against, as Stallmann put it, the EPO's "campaign in favour of software patents in Australia" by carrying a placard saying "don't get caught in software patent thickets" and distributing copies of his article about IP being a seductive mirage. We're here at the World Computer Congress and what I've discovered is that the European Patent Office is here to campaign in favour of software patents in Australia. [...] You can be sure that if Australia allows software patents, almost all the patents will belong to foreigners and will give them the opportunity to sue Australians. [...] There's no problem that requires a solution with anything like software patents. Without software patents [...] neither of us would get sued by the various patent troll companies whose sole business is collecting patents so that they could go threaten people. The discussion on patent-eligibility of software in Australia was fired by New Zealand's approach to only allow patents on "embedded software" (see earlier posting). Currently, the the Australian IP Advisory Council prepares a review on patentable subject matter, while an open petition asking the Australian government to end software patents attracted 1083 signatures - mainly from free-software developers (see reports on OStatic an itNews). Of course, Australia already grants patents for inventions implemented wholly or partially in computer software, and has done so for over 20 years. To date this has not resulted in an opening of the metaphorical (and largely mythical) floodgates to "foreigners" suing Australians for infringement of software patents. Computer Scientist, European Patent and Trademark Attorney, and Partner of k/s/n/h. Visd § 55 (2) RStV: PA Dr. Volker Metzler, KSNH Patentanwälte, Destouchesstr. 68, Munich, DE 80796, vm(at)ipblog.eu, Phone: +49 89 307741 0 (FAX: -41). "Patentanwalt" is a regulated profession according to the PatAnwO supervised by the Patentanwaltskammer, Tal 29, Munich, DE 80331. "European Patent Attorney" is a regulated profession according to the EPC supervised by the European Patent Institute, Bayerstr. 83, Munich, DE 80335 (see code of conduct). "European Trademark Attoney" is a regulated profession according to the Council Regulation (EC) No 40/94 of 20.12.1993. The content of this Weblog is maintained by myself and entirely reflects personal opinions. I try to keep the provided content as correct as possible. However, errors cannot be ruled out and I assume no liability for disadvantages which might result from the use of the content provided. Using this Weblog does neither constitute furnishing of legal advice nor does it establish a client/attorney relationship.